Turan Gönen is currently a professor of electrical engineering and director of the Electrical Power Educational Institute at California State University, Sacramento. He has taught electrical machines and electric power engineering for more than 39 years. Dr. Gönen also has a strong background in the power industry; for eight years he worked as a design engineer in numerous companies both in the United States and abroad. He has been a consultant for the United Nations Industrial Development Organization (UNIDO), Aramco, Black & Veatch Consultant Engineers, and the public utility industry. Dr. Gönen has written more than 100 technical papers as well as several books. He is a Life Fellow member of the IEEE and the Institute of Industrial Engineers. "This book offers a comprehensive coverage of all classical topics in power system analysis such as basic concepts of three AC circuits and per unit calculation, transmission line, power flow analysis, fault analysis and protection system etc. 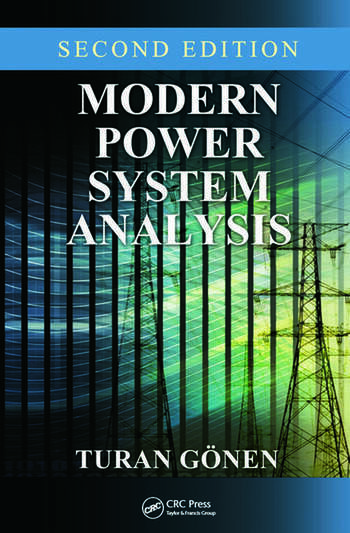 This second edition is a modern update of the book, which features clear and easy-to-understand text ideally suited for power system analysis courses at senior undergraduate level and graduate level." "... the book provides a fresh perspective." "This book is written specifically for the study of modern power systems with emphasis on power-transmission engineering. It introduces the reader to concepts and issues relevant to the power utility industry. ... In using this book, the reader will gain a very good understanding of power engineering fundamentals, from understanding and being able to use symmetrical component theory to writing MATLAB code for power-ftow analysis. This book is well written and has numerous illustrations and worked out examples to reinforce learning. The book could be used in a senior-level undergraduate class or graduate-level class in power engineering as well as by practicing engineers in a power utility or others who may want to teach themselves."